Southwest Native American Navajo Artisan made Sterling Silver Wedding Rings, Wedding Bands, Engagement and Bridal Wedding Ring Sets for your Special Day! Native American Artisan Wedding Rings are symbols of love, faith, and honor suitable for traditional and non-traditional wedding ceremonies. We offer a selection of Gold Silver Mixed Metal Bands and Inlay Band Rings for Men and Women by Navajo Silversmith Wilbert Muskett jr and Ella Cowboy in various materials such as Turquoise, Lapis, Orange Purple Red and Mix Spiny Oyster Shell, Coral, Jet, Purple, Blue, Pink and White Fire Opals. Native American Navajo Bridal Engagement Wedding Ring Sets and Wedding Bands for Men and Women. Large selection of ring sizes available for immediate delivery. 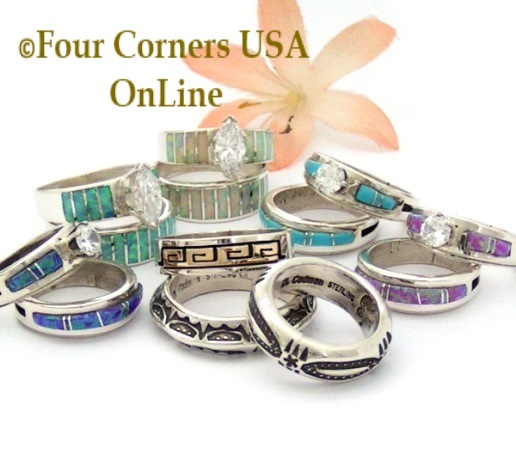 Our Navajo Inlay Wedding Rings are offered in Turquoise, Purple Opal, White Opal, Blue Opal, Pink Opal and Black Jet. Engagement Bridal Ring and Wedding Band Sets perfect for your Special Day, Anniversary Gift, Vow Renewal and Commitment Ceremonies. Featured Artists for our Native American Wedding Rings include Navajo Silversmiths Ella Cowboy, Wilbert Muskett Jr. and David Skeets with selections from Peggy Skeets as well.